I have not really kept it a secret that my family has a candle obsession. We have at least two in every room of the house. So over many years, we've tried tons of different brands and scents, and we are constantly on the look out for the next best candle. Well.. I think we may have found one of the new great candles - Family Candles. The first thing I noticed about my candle, was the strong scent. When my package arrived, and I cut it open, even though the candle had a lid, the scent flowed out, after I opened it. I love that, because the problem I seem to have with most candles, is that the scents don't really permeate throughout the room. With Family Candles, I found what I love the most. A candle that you can light, and really bring a change to the room. In fact, when I lit the candle for 2 hours, blew it out, left, and returned home - The house still lightly smelled like Passion Fruit Guava. 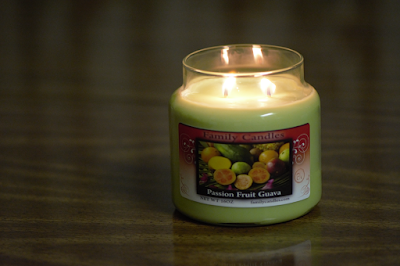 I've always been a bit more drawn to floral, or holiday scents - But I was actually pleasantly surprised with the Passion Fruit Guava I received. Fruit scents are usually too strong for me, but this one was perfect. It wasn't overpowering, and just lightly filled the house, to where you could notice it. Another thing that really draws me to Family Candles, is that they're 100% soy wax, and they are all hand made candles. I know for me, purchasing a candle that supports a family and a home business, rather then a large corporation, makes me feel really good. The candles also last about 80 hours, and are very affordable at $14.99 for a 16 oz candle. With as much entertaining as we're doing, I plan on having my Family Candle front and center this Easter, to brighten up the room, and make everyone feel welcomed. Overall, I'm very happy with my Family Candle, and there are definitely a lot of other great scents I would love to try. 80 hours with a strong scent that lasts? Now you're definitely talking to me right now. I love candles and we have them around the house as well. I also do the scented wax. I'd love to give this brand a try. I'm a HUGE candle lover! No really, there's never a time when there isn't a candle burning in my room (expect when I'm sleeping, of course.) I love candles with strong scents so this one sounds right up my alley. I love having candles burning around the house! These sound like a great brand of candles and I will have to check them out, since a couple of my candles are getting pretty low! I will have to try these! I love candles, and I love to try new brands. I love using candles in my home. I find them so relaxing to be totally honest with you. I haven't heard of this brand before today but I would love to get my hands on one of these candles. These sound really nice. It would be great to have a few fruit scents for this time of year. I am absolutely OBSESSED with floral candles. There is something about the scent and the light that helps me relax on the most stressful of days. This seems really awesome, and I bet it smells good too! Nice, this is the time of year when I swap out my candles. I'm removing the heavy winter scents for clean and fresh smelling spring scents. I've always loved Yankee Candles. My favorites are always the light floral scents. My mids can't tell the difference. 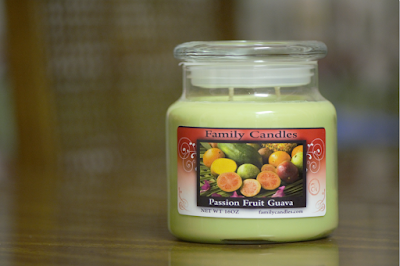 That Passion Fruit Guava looks like it smells amazing! I love candles that burn for 50+ hours. Will have to keep my eyes out for Family Candles. I love the smell of candles that are a little subtle ( not over-powering) I'll have to check these out! Wow this sounds like one great candle! Long lasting scent! I like candles, too. The perfect scent can really spruce up a dull room or even improve your mood. They can change the entire feel of your home. We have a rather large bathtub and have all kinds of candles around it...in bathrooms, in the kitchen. everywhere. I like to leave the lids off even when they're not burning so the scent is lightly in the room. I love Guava candy, I can only imagine how beautiful it smells in a candle. I know a few people who would be ecstatic to receive a candle like this. Scented candles are my favorite! I would love to have my very own Passion fruit guava candle!!! I'm a candle fanatic and I hate it when I buy a scented candle that doesn't really have a lot of scent. These sound really nice. I have lately become very, very picky about candles. I only buy handmade ones now from little makers like this. Hmmm..the room must have smelled yummy with this candle lit! It's so important to support small businesses like these. I LOVE candles, especially those that fill the room with fragrance. And while I'm pretty new to soy-wax candles, I absolutely love them. I really believe that it's worth spending a few extra dollars on purchasing a high-quality candle, especially one made by a small company. Family Candles is definitely one that I want to check out. I got rid of most of my candles that were not soy since they're not good for you, so I need to replace them. I do like strong scented candles like this one. I absolutely love scented candles. I especially love the homemade ones. They are not an stinky as Yankee Candle.